October 5, 1962 The group releases their first single, Love Me Do. Brian Epstein reportedly buys 10,000 copies to ensure it a place in the top 20. February 11, 1963 Please Please Me, their first album, is recorded in a 10-hour session, and released on March 22nd. February 16, 1963 Please Please Me becomes the Beatles' first number one single in England. October 13, 1963 The band appears on the TV show Sunday Night at the London Paladium. Several weeks later they perform at the Royal Variety Show. November 22, 1963 The release of their second album, With the Beatles. 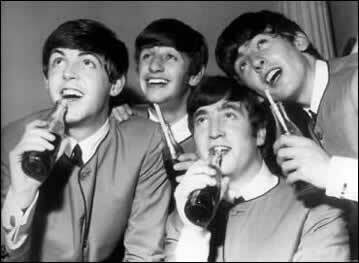 Febuary 9, 1964 Their first performance on America's Ed Sullilvan show is seen by an estimated 73 million people. April 4, 1964 Beatles songs occupy the first five spots on the American singles chart. 1 to 5 are: Can't Buy Me Love, Twist and Shout, She Loves You, I Want to Hold Your Hand and Please, Please Me. July 6, 1964 A Hard Day's Night, directed by Richard Lester, premieres in London. The film is a fictional day in the life of the fab four, and garners rave reviews. July 10, 1964 Album number three, A Hard Day's Night, a soundtrack to the film. August 18, 1964 The band begins their second tour of America. Mass Beatlemania ensues. 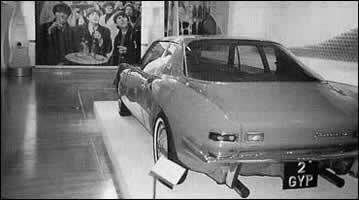 Avanti at the Design Museum with a poster of the Beatles.